Today I came across two kinds of coffeemaker and I have to choose the one which is simply the best in all aspects. 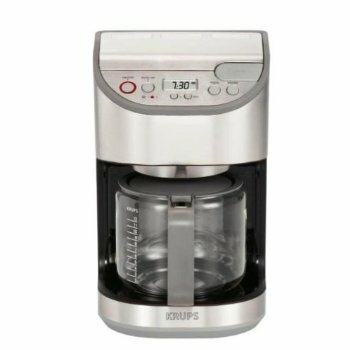 The krups KM4065 machine is programmed running on 1100 watts and it makes 12 cup of coffee at once. The control panel on top of it makes easy programming for you to choose with help of LCD screen. It also has the two auto on presets which comes with aroma selection helps you makes small amount of coffee in the right proportion and auto shut off function which makes the machine shut down after you are done using. This machine brews your coffee efficiently. One of the best things about this is that it comes with one year warranty. The Nescafe KP10009 Piccolo machine is very tiny and stylish in looks and also has the mess free capsule which brews your coffee clean and neat. It operates using 1500 watts and also heats up your coffee pretty fast. It also makes your coffee with hot/cold selection which one of the extra choice you have. Coffee, latte, espresso or cappuccino; all this will be available just as you wish. An adjustable drip tray for small or big size of cups you wish to have your coffee on. The brewing result is just so genuine that you would want to have more. This coffee maker also has one year warranty. So guys, what do you think I should get? Both are good but obviously one of this has to be the best. Which one do you suggest? Join in and write your own page! It's easy to do. How? Simply click here to return to Krups-KP1009.